Indonesia’s deforestation nightmare is choking thousands and making climate change worse. Joko was in Washington, DC, for a photo op with President Barack Obama, to talk about climate change, and to promote Indonesia as a choice venue for foreign investors. His trip was also supposed to include a stopover in San Francisco for meetings with tech industry executives. But Joko’s decision to return to Indonesia early underscores the challenges his country faces in stopping the worst deforestation on Earth — deforestation that is playing a critical role in global climate change. There’s more to global warming than pollution from cars and power plants. In the United States, coal-fired power plants are the No. 1 source of carbon dioxide emissions, followed by tailpipe emissions from cars and trucks. That’s why the Obama administration has focused its climate policies on those sources; Obama’s signature plan aims to reduce power-sector emissions by one-third by 2030. Those policies get some natural help from the ecosystem, as trees and soil soak up carbon out of the atmosphere. In the United States, thanks to forest conservation and climate-friendly farming practices, land use (a term climate wonks use to describe emissions that come from the land rather than from man-made infrastructure and vehicles) actually offsets about 13 percent of the greenhouse gas emissions from the rest of the economy. 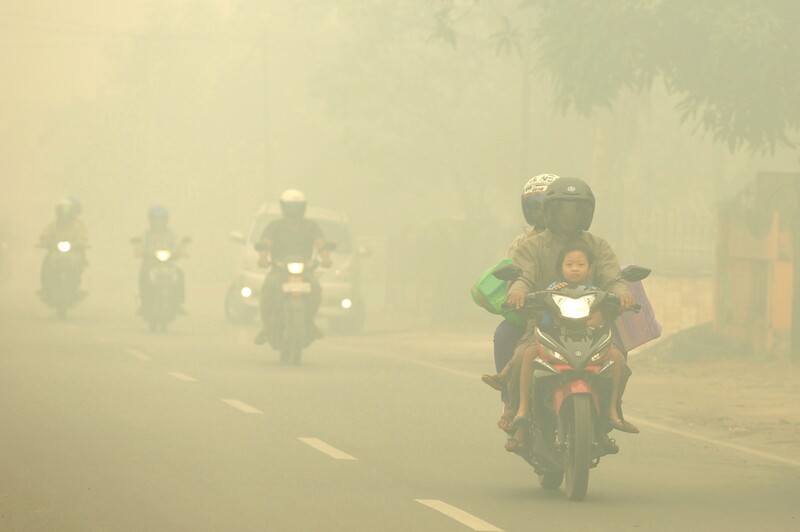 Indonesia is in the middle of a public health crisis from forest fire haze. The problem isn’t just deforestation, but how that deforestation is happening. 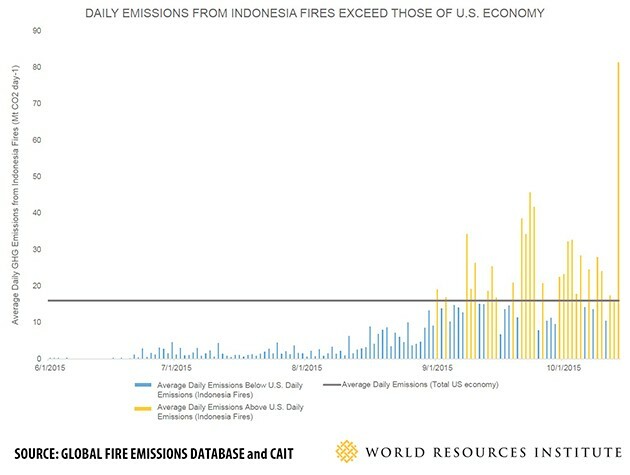 In Indonesia, forests are often cleared out with fire. This can be done legally with a permit, but it’s often carried out illegally as well. This year, forest fires are also being fueled by El Niño-related weather patterns. The combination of El Niño and intentional deforestation has proven incredibly dangerous: The country has experienced nearly 100,000 fires so far this year, the worst since the last major El Niño in 1997. Fire activity typically ramps up in September and October, the end of the dry season, and over the last couple of weeks the conflagrations have grown to crisis proportions — hence Joko’s hasty return. The fires are so big they can be seen from space. Palm oil has some advantages over other oils: It’s cheap to produce and doesn’t contain trans fats, and the trees yield far more oil in the same land area — using fewer chemical fertilizers — than soybeans or sunflowers. According to the World Bank, the increase in global demand for cooking oil by 2020 could be met with palm oil using one-seventh the land area that would be required to fill that demand using soybeans. For that reason, it could actually have many environmental advantages over other types of oil. Unfortunately, much palm oil production now happens in highly vulnerable ecosystems, often in the former habitats of endangered animals such as tigers and orangutans. Pressure is growing on Indonesia’s palm oil producers to stop deforestation and stay out of sensitive areas. A handful of major US food processors, including Nestlé and PepsiCo, have adopted commitments to rid their supply chains of palm oil linked to deforestation, according to a report from the Union of Concerned Scientists. But that report also that found many fast-food chains are lagging behind. Last year, an Indonesian court ordered the first-ever major fine — $30 million — for a palm oil company found to have cleared forest in protected orangutan habitat. Originally published at www.motherjones.com on October 27, 2015. A journalistic collaboration on changing climate. The Atlantic, Atlas Obscura, CityLab, Fusion, Grist, The Guardian, High Country News, HuffPost, Medium, Mother Jones, The National Observer, New Republic, Newsweek, Reveal, Slate, Undark, and Wired.